Amy's Creative Side: 1 : : Thank You!! 1 : : Thank You!! I helped a friend out with a little bloggy info - she blessed me with fabric! Thank you Kristina!! Hey Park City Girl! I'm heading that way in 2 weeks. Can you give me some tips on great places to go and see? eating, quilting, thrifting, etc? Thank You and love the fabrics. I've been trying to get my hands on some Wildwood for a while now! You must have been a terrifc help. That is a nice stack of fabric. The studio blog tour sounds like a lot of fun. That was really a sweet 'thank you'. fabric = best gift ever!! I love the little trees on the bottom of the left stack! Saw this blog post and thought of you. You could probably sew this in about 2minutes...but it's one of the cutest things. Maybe your girls need them! What a great stash of fabrics! They look so Summery and crisp! Ooohhh -- very pretty fabric! Know you'll make something lovely with it. 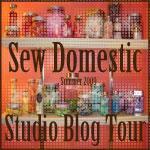 And, I'll be looking forward to seeing everyone's sewing studios! Thanks for the info! Great bloggy friend. Thanks for the studio tour info. Now i'm going to cry - that left pile is what i've been drooling over for weeks and weeks! We just started a business so i'm not allowed to buy fabric for a while. Sob! what a fun group of fabrics! I can't wait to see what you make with it. Yay pretty fabric. Love the place mat above too. What a sweet gesture! Those fabrics are so bright and cheery!